Hydropower systems, also known as hydroelectric power, harness the energy of flowing water to produce electric or mechanical energy. Hydroelectric installations are the most common and least expensive source of renewable electricity in the United States today. According to the Department of Energy, Energy Information Administration, in 2013 more than 6 percent of the country’s electricity was produced from hydropower resources and nearly 52 percent of all renewable electricity generated in the United States comes from hydropower resources, mostly at large dams. Hydropower, especially large-scale hydropower, is valued for its reliability, with many facilities operating for over 100 years, and low-cost provision of base load electricity. Although few, if any, new large dams are under consideration in Wyoming, the opportunity for installing small hydropower is now more feasible with recent changes in federal policy. There is significant potential for additional small hydropower generation in Wyoming. In 2011, the United States Department of the Interior, Bureau of Reclamation, Power Resources Office conducted an extensive nationwide assessment of hydropower resources at existing U.S. Bureau of Reclamation (Reclamation) facilities[iii]. This resource assessment evaluated the feasibility of additional hydropower development at existing Reclamation facilities. The assessment was targeted towards water users and private developers that could further evaluate the potential to increase hydropower production at Reclamation sites. 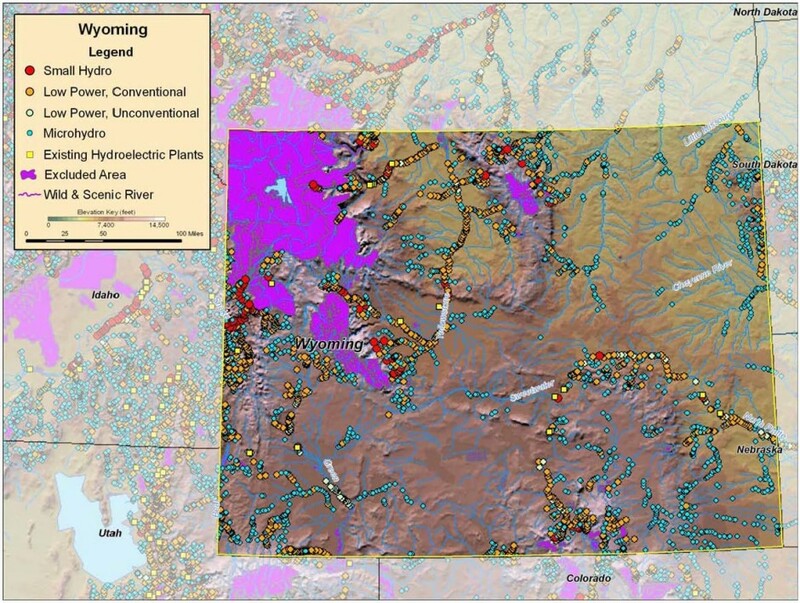 The study identified 17 potential hydropower sites in Wyoming that included reservoir dams, diversion dams, and canals with a potential to generate 47,187 MWh of electricity annually at existing Reclamation facilities. Of the 17 potential sites, three had a benefit-to-cost ratio greater than 1.0, indicating a potentially cost-effective location for hydropower development. These three sites are listed in the table below. Another report by the Idaho National Engineering and Environmental Laboratory for the U.S. Department of Energy, Energy Efficiency and Renewable Energy Office in 2004 assessed the water energy resources of stream reaches throughout the United States. [vi] The principal focus of the study was on low-head (less than 30 feet)/low power (less than 1 MW) resources. The assessments were made by estimating the power potential of all the stream segments in a region, which averaged 2 miles in length. Figure 2 shows the results of this study for Wyoming. Source: U.S. Department of Energy. Water Energy Resources of the United States with Emphasis on Low Head/Low Power Resources. April, 2004. The total available power potential was subdivided into small hydro (one MW or more), low power conventional (less than one MW and heads greater than 8 feet), low power, unconventional (less than one MW and heads less than e8 feet), and micro-hydro (less than 100 kW). This study concluded Wyoming had 2,840 potentially feasible small hydropower projects with 507 MW of potential capacity. Sixty-five percent were classified as micro-hydro projects. Between these three studies, Wyoming’s estimated untapped hydropower potential is over 540 MW of generation capacity. The assessment considers technical feasibility, thus the amount of truly viable new development is much lower. There is potential for hydropower development on municipal water systems, non-federal irrigation districts, and private dams, in addition to the potential sites identified in these three studies. The power potential from these types of installations has not been quantified, but several examples of these types of installations are described in the following sections. [iii] United States Department of the Interior, Bureau of Reclamation, Power Resources Office. Hydropower Resource Assessment at Existing Reclamation Facilities. March 2011. [iv] United States Department of the Interior, Bureau of Reclamation, Power Resources Office, Site Inventory and Hydropower Energy Assessment of Reclamation Owned Conduits: Supplement to the “Hydropower Resource Assessment at Existing Reclamation Facilities Report”, March 2012. [v] Based on the Public Service Commission’s estimate the average home consumes 850 kWh/month. [vi] United States Department of Energy, Energy Efficiency and Renewable Energy Wind and Hydropower Technologies. Water Energy Resources of the United States with Emphasis on Low Head/Low Power Resources. DOE/ID-11111. April 2004.